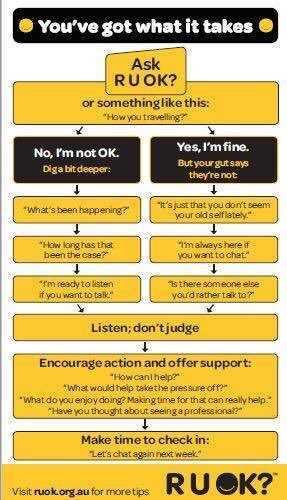 R U OK Day today encouraging all of us to check in with others to see if they’re OK. But what if someone says “no”? What should you say or do? Should you tell someone else? What resources can you point to, and what help is available? Orygen, The National Centre of Excellence is seeking expressions of interest (EOI) from all Aboriginal and Torres Strait Islander young people who would like to share their expertise, advice, and ideas and contribute to the development of a suicide prevention social media campaign! 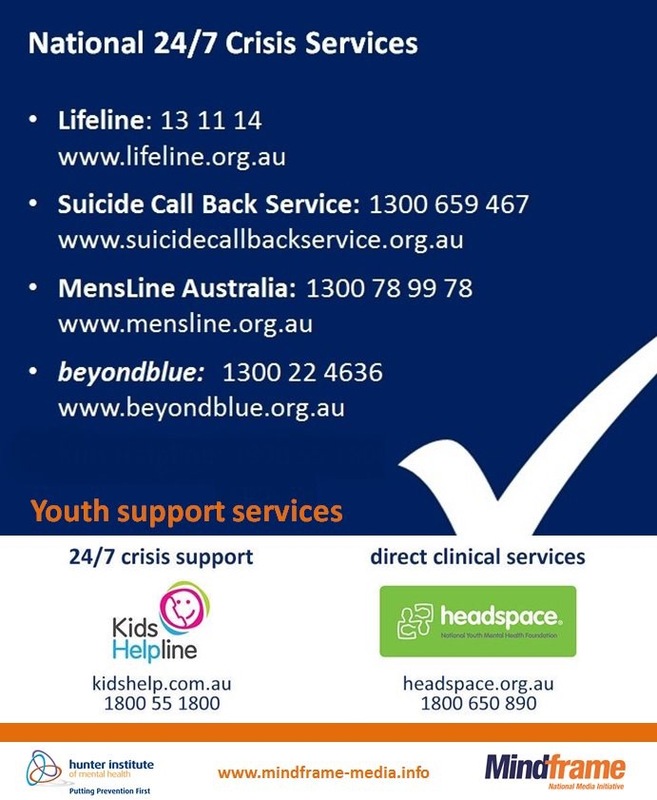 We would like to partner with Aboriginal and Torres Strait Islander young people to co-design a suicide prevention social media campaign specifically for the Aboriginal community. The campaign will focus on educating and empowering young people to support themselves and other young people within their online social networks. Rather than speaking on behalf of Aboriginal communities, we wish to draw on the expertise, cultural identities, and strengths of the community to inform campaign materials. The co-design workshop will involve a yarning circle, where young people will be given the opportunity to share their experiences and express their needs. The yarning circle will be facilitated by an Aboriginal and Torres Strait Islander person. The workshop will also involve working together, in groups, to generate ideas for a social media campaign (e.g., digital storytelling, drawing, etc.). 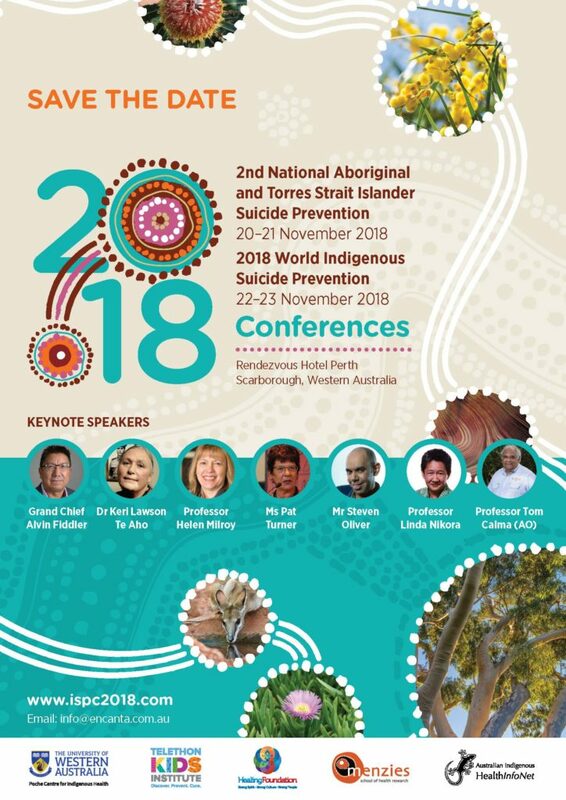 The workshop will be hosted in Perth, as a part of the The 2nd National Aboriginal and Torres Strait Islander Suicide Prevention and World Indigenous Suicide Prevention Conferences. The workshop will be conducted in the morning and breakfast will be provided. Young people will be reimbursed $30.00 per hour for their time. Oyrgen would like to sponsor 10 Aboriginal and Torres Strait Islander young people to take part in our co-design workshop and The 2nd National Aboriginal and Torres Strait Islander Suicide Prevention and World Indigenous Suicide Prevention Conferences, hosted from 20 to 23 November, in Perth, by providing a bursary. To be eligible for Orygen’s bursary funding, the applicant must be an Aboriginal and Torres Islander young person, aged between 18 and 25 years. We encourage young people from all geographic regions, across Australia, to apply. The co-design workshop will involve a yarning circle, where young people will be given the opportunity to share their experiences and express their needs. The yarning circle will be facilitated by an Aboriginal and Torres Strait Islander person. The workshop will also involve working together, in groups, to generate ideas for a social media campaign (e.g., digital storytelling, drawing, etc.). 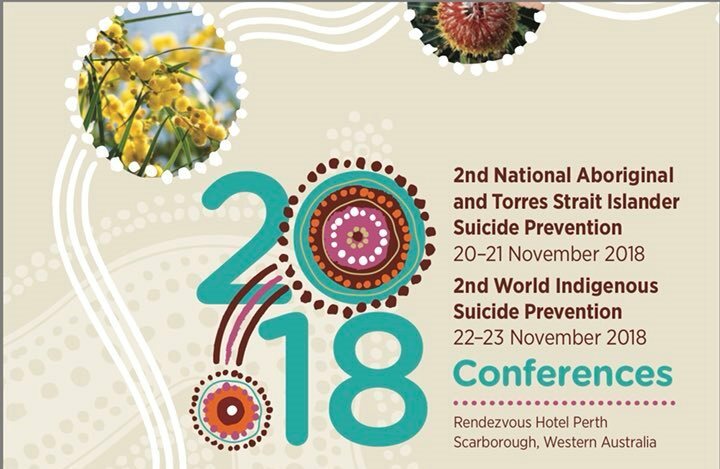 The workshop will be hosted in Perth, as a part of the The 2nd National Aboriginal and Torres Strait Islander Suicide Prevention and World Indigenous Suicide Prevention Conferences. The workshop will be conducted in the morning and breakfast will be provided. Young people will be reimbursed $30.00 per hour for their time. If you would like to be a part of the co-design workshop, please email your application to Jo at jo.robinson@orygen.org.au. Submissions can be made on, or before Sunday, 30 September, 2018. 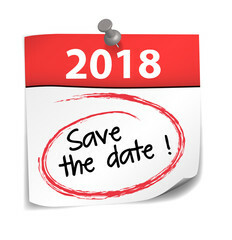 In the first week of October, a panel consisting of Oyrgen staff, a Culture is Life representative, Professor Pat Dudgeon from the conference organising committee, Summer May Finlay (a Yorta Yorta woman), and young people will review all written applications and select 10 successful applicants. The selection panel will endeavour to select a diverse range of young people. The 10 successful applicants will be notified by email by mid-October. The success applicants will have until 31 October, 2018 to accept the bursary offered.
. Submissions can be made on, or before Sunday, 30 September, 2018. There are a wide range of data sources available that contribute to our understanding of alcohol, tobacco and other drug use. 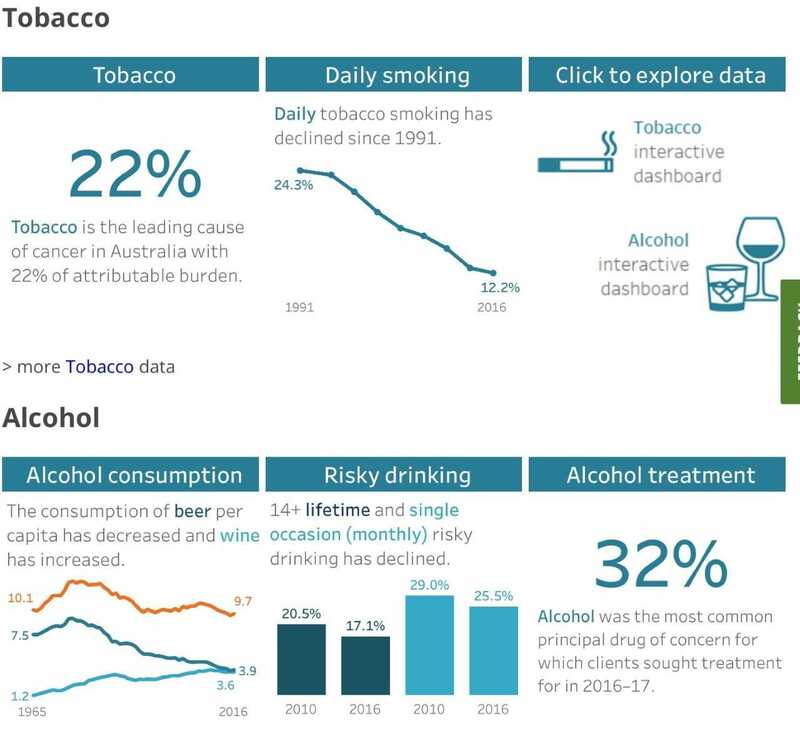 This web report from AIHW is intended to be a general reference for contemporary data on alcohol, tobacco and other drugs in Australia. This report consolidates the most recently available information regarding the use of tobacco, alcohol, cannabis, meth/amphetamines and other stimulants, the non-medical use of pharmaceutical drugs, illicit opioids (heroin) and new (and emerging) psychoactive substances (NPS). Key trends in the availability, consumption, harms and treatment are identified and detailed data are presented for vulnerable populations. Australia’s Burden of Disease study analyses the impact of nearly 200 diseases and injuries in terms of living with illness (non-fatal burden) and premature death (fatal burden). In 2015, a report was released that provides estimates of burden of disease between Indigenous and non-Indigenous Australians . 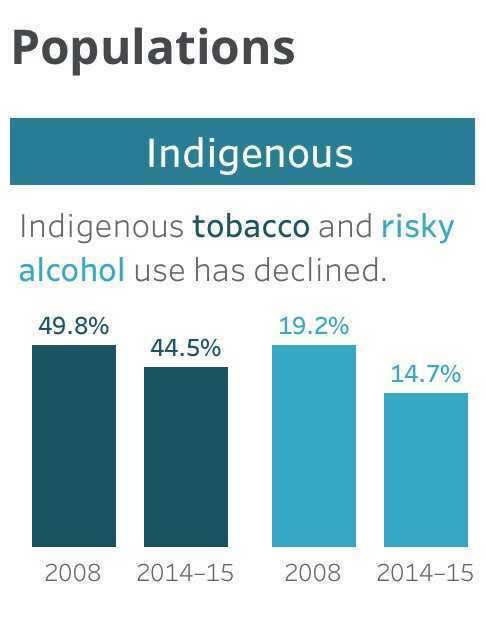 Over a similar 20-year period, the National Health Survey (NHS) the proportion of non-Indigenous smokers aged 18 and over declined, from 24% in 1995 to 16% in 2014–15 (Table S3.5). Indigenous mothers accounted for 19% of mothers who smoked tobacco at any time during pregnancy in 2015, despite accounting for only around 4% of mothers. The age-standardised rate of Indigenous mothers smoking during pregnancy has decreased from 50% in 2009 to 45% in 2015. Almost 1 in 2 (45%) Indigenous mothers reported smoking during pregnancy—compared with 12% of non-Indigenous mothers (age-standardised). The age-standardised rate of Indigenous mothers quitting smoking during pregnancy (14%) is about half that of non-Indigenous mothers (25%) (based on mothers who reported smoking in the first 20 weeks of pregnancy and not smoking after 20 weeks of pregnancy) . 35.1% of Aboriginal or Torres Strait Islander people compared with 58.3% of non-Indigenous Australia self-assessed their health as ‘excellent’ or ‘very good’ (age-standardised per cent). 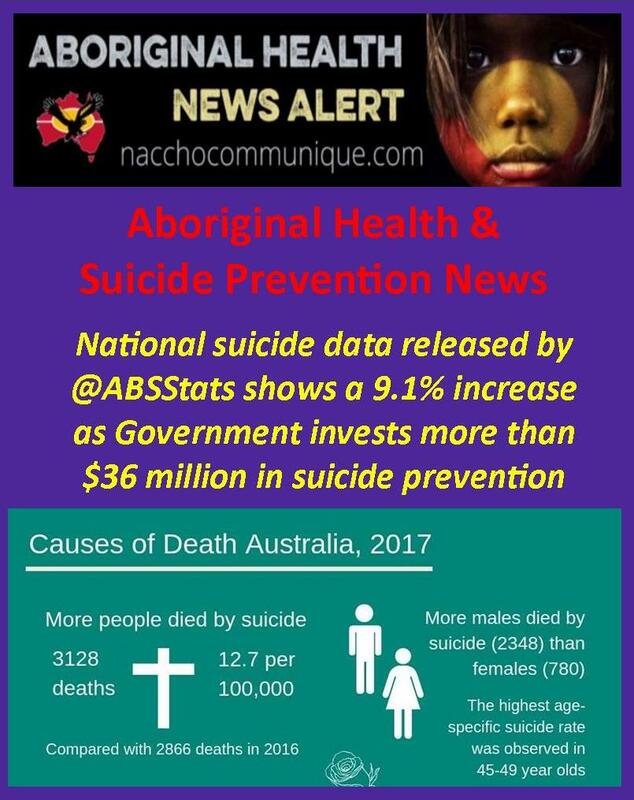 32.5% of Indigenous Australians compared with 12.3% of non-Indigenous Australians reported high/very high psychological distress (age-standardised per cent). 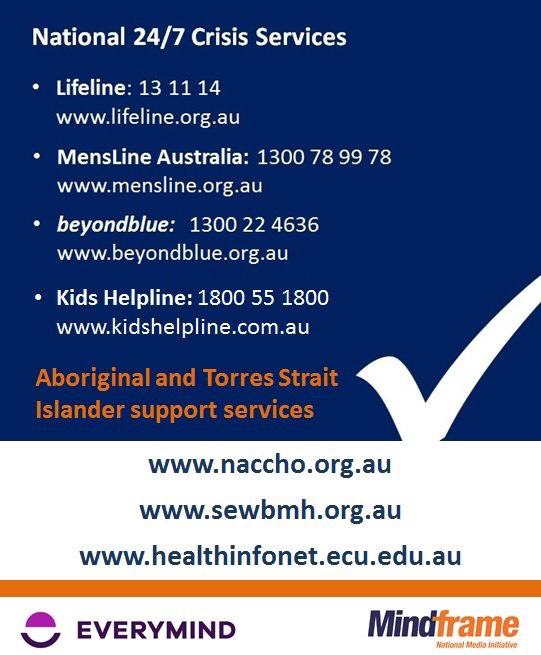 71.0% of Aboriginal or Torres Strait Islander people reported having a long-term health condition compared with 55.3% of non-Indigenous Australians (age-standardised per cent)  (Table S3.6). Almost 1 in 2 Indigenous Australians with a mental health condition were a daily smoker (46%) and about 2 in 5 (39%) to have used substances in the last 12 months. This was higher than for Indigenous Australians with other long-term health conditions (33% and 24%, respectively) or those with no long term health condition (39% and 29% respectively)  (Table S3.11). Amphetamines was the principal drug of concern, Indigenous Australians (1,204 per 100,000 population) were 8 times more likely than non-Indigenous Australians (155 per 100,000 population). Heroin was the principal drug of concern Indigenous Australians (911 per 100,000 population) were 7 times more likely than non-Indigenous Australians (123 per 100,000 population) were. Cannabis was the principal drug of concern Indigenous Australians (867 per 100,000 population) were 7 times more likely than non-Indigenous Australians (126 per 100,000 population) were. 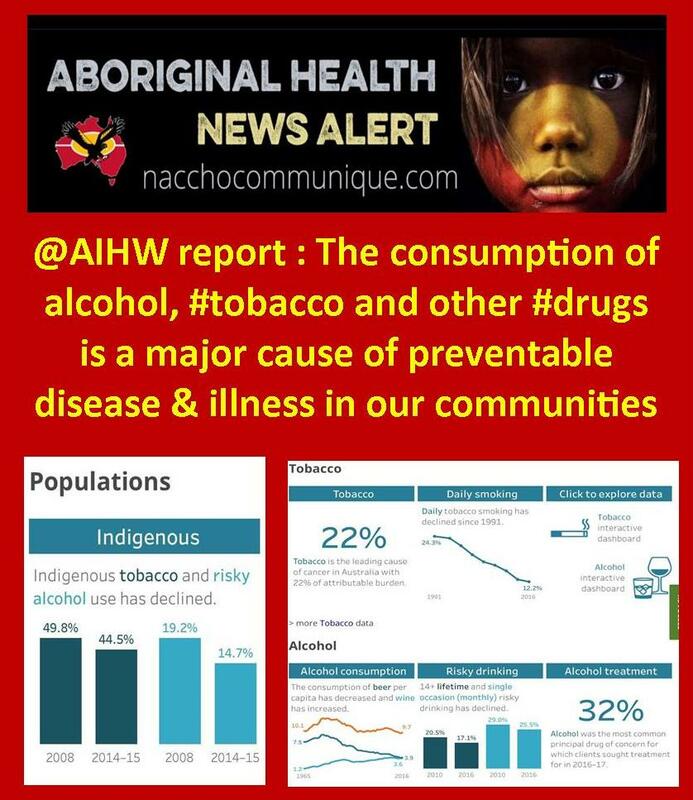 Alcohol was the principal drug of concern Indigenous Australians (136 per 100,000 population) were 7 times more likely than non-Indigenous Australians (26 per 100,000 population)  (Table S3.14). Around 1 in 10 clients (9%) were Indigenous, an overrepresentation relative to their population size. 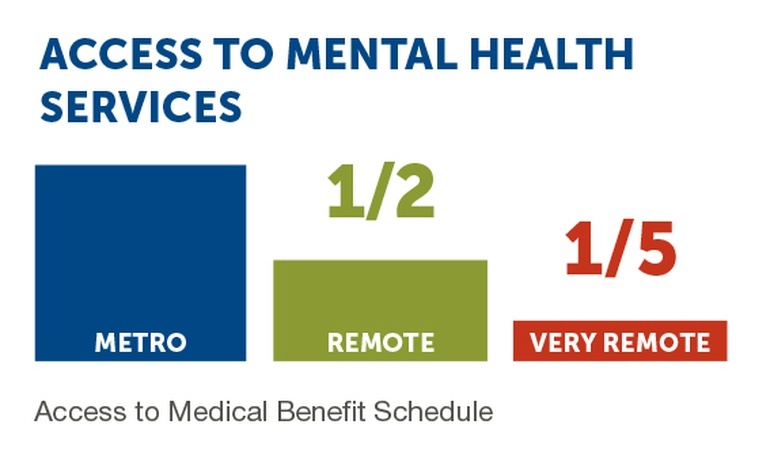 One third of all treatment episodes were in Very remote areas (32%) and the highest proportion of clients were located in Major cities (35%). “All of our 6000 staff in 145 member services in 305 health settings across Australia will have access to this new and update edition of the National Guide. It’s a comprehensive edition for our clinicians and support staff that updates them all with current medical practice. 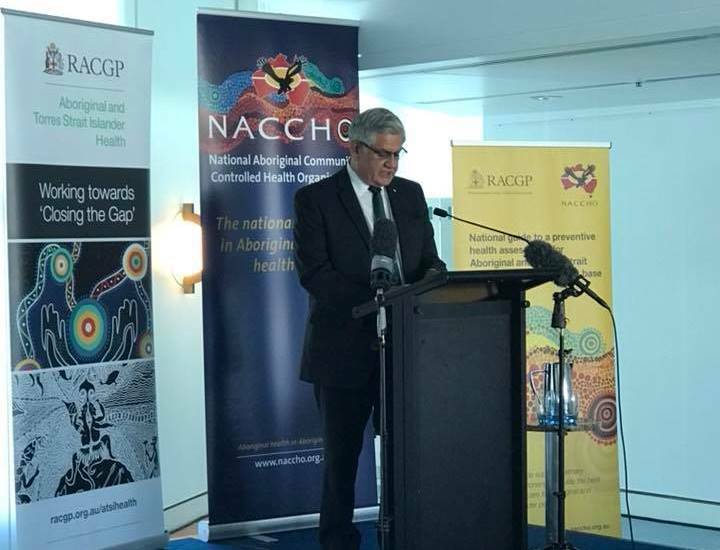 NACCHO Chair John Singer said the updated National Guide would help governments improve health policy and lead initiatives that support Aboriginal and Torres Strait Islander people. “Prevention is always better than cure. Already one of the most widely used clinical guidelines in Australia, this new edition includes critical information on lung cancer, Foetal Alcohol Spectrum Disorder and preventing child and family abuse and violence. 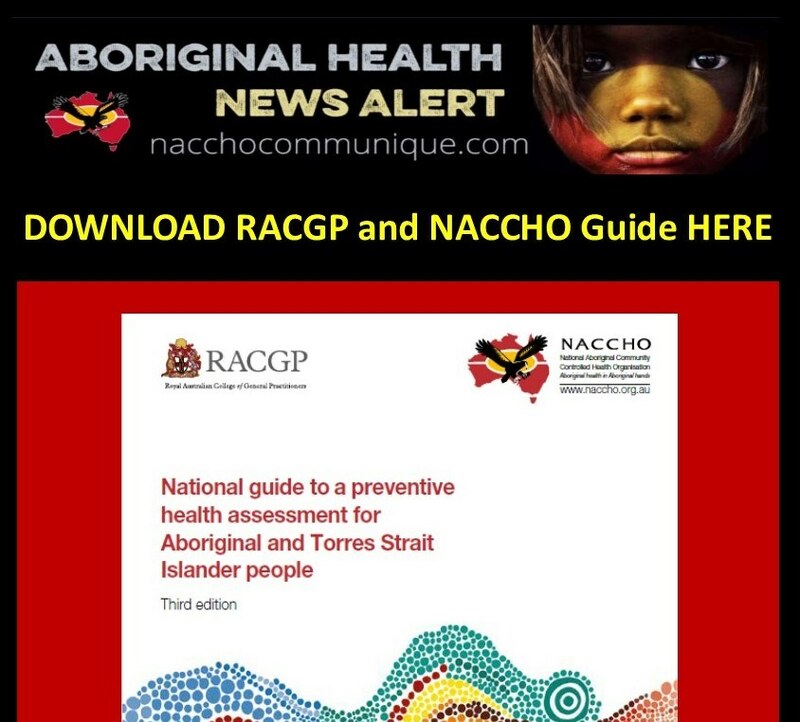 The Royal Australian College of General Practitioners (RACGP) and the National Aboriginal Community Controlled Health Organisation (NACCHO) have joined forces to produce a guide that aims to improve the level of healthcare currently being delivered to Aboriginal and Torres Strait Islander patients and close the gap. 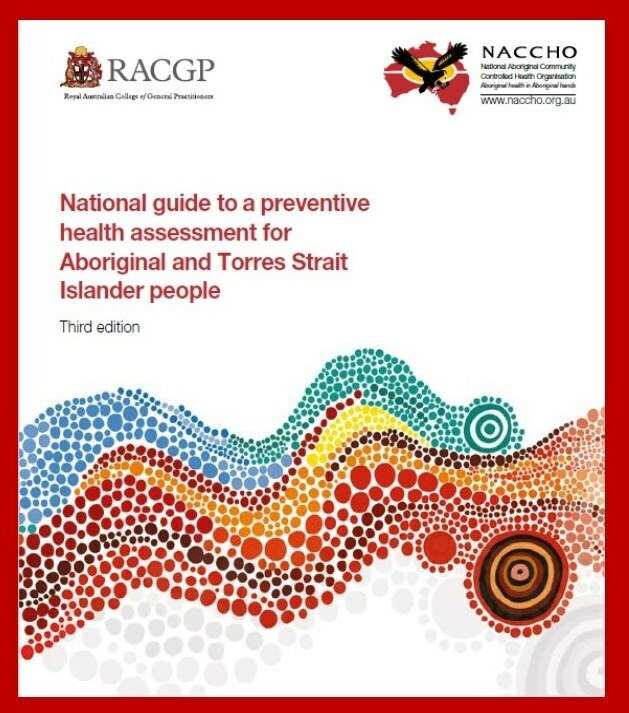 Chair of RACGP Aboriginal and Torres Strait Islander Health Associate Professor Peter O’Mara said the third edition of the National guide to a preventive health assessment for Aboriginal and Torres Strait Islander people (the National Guide) is an important resource for all health professionals to deliver best practice healthcare to Aboriginal and Torres Strait Islander patients. “The National Guide will support all healthcare providers, not just GPs, across Australia to improve prevention and early detection of disease and illness,” A/Prof O’Mara said. “The prevention and early detection of disease and illness can improve people’s lives and increase their lifespans. 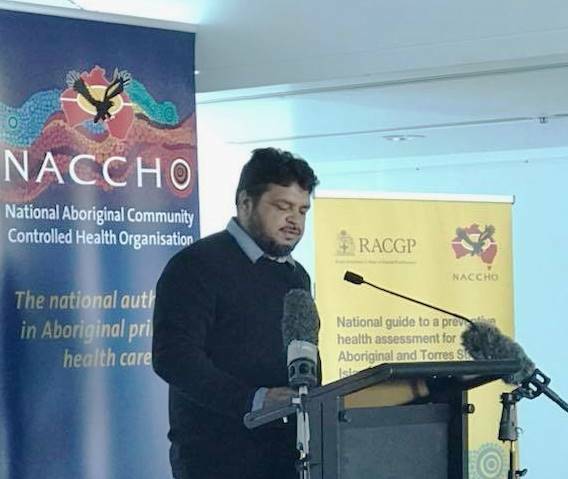 RACGP President Dr Bastian Seidel said the RACGP is committed to tackling the health disparities between Indigenous and non-Indigenous Australians. “The National Guide plays a vital role in closing the gap in Aboriginal and Torres Strait Islander health disparity,” Dr Seidel said. “Aboriginal and Torres Strait Islander people should have equal access to quality healthcare across Australia and the National guide is an essential part of ensuring these services are provided. The updated third edition of the National Guide can be found on the RACGP website and the NACCHO website. The critical role of preventive care and tackling the precursors of chronic disease is being boosted in the latest guide for health professionals working to close the gap in health equality for Indigenous Australians. 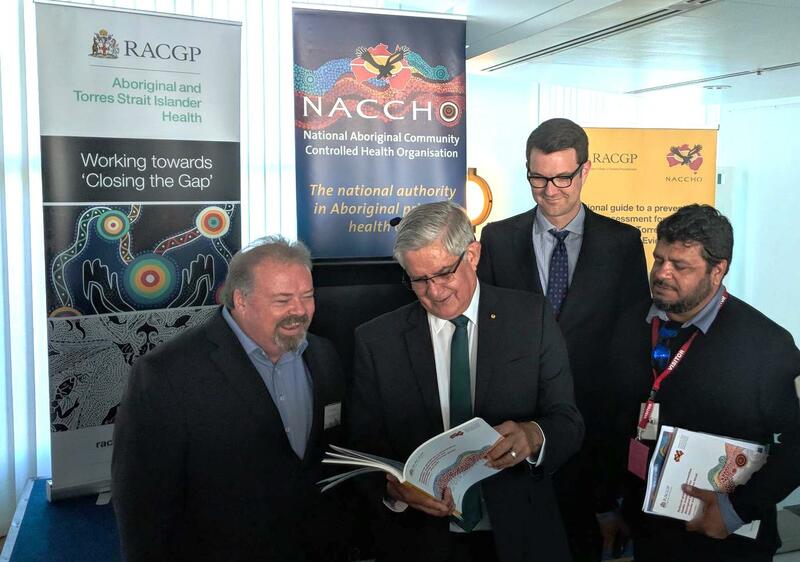 Minister for Indigenous Health, Ken Wyatt AM, today launched the updated third edition of the National guide to a preventive health assessment for Aboriginal and Torres Strait Islander people. “Prevention is always better than cure,” said Minister Wyatt. “Already one of the most widely used clinical guidelines in Australia, this new edition includes critical information on lung cancer, Foetal Alcohol Spectrum Disorder and preventing child and family abuse and violence. “The National Guide maximises the opportunities at every clinic visit to prevent disease and to find it early. 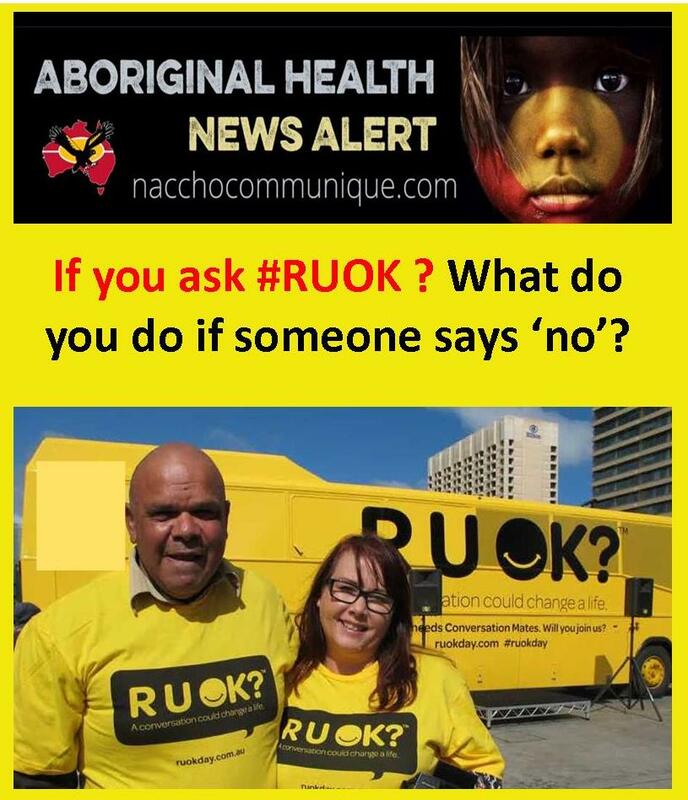 The guide, which was first published in 2005, is a joint project between the National Aboriginal Community Controlled Health Organisation (NACCHO) and the Royal Australian College of General Practitioners RACGP). “To give you some idea of the high regard in which it is held, the last edition was downloaded 645,000 times since its release in 2012,” said Minister Wyatt. “The latest edition highlights the importance of individual, patient-centred care and has been developed to reflect local and regional needs. “Integrating resources like the national guide across the whole health system plays a pivotal role in helping us meet our Closing the Gap targets. “The Turnbull Government is committed to accelerating positive change and is investing in targeted activities that have delivered significant reductions in the burden of disease. The National Guide is funded under the Indigenous Australian’s Health Programme as part of a record $3.6 billion investment across four financial years. The RACGP received $429,000 to review, update, publish and distribute the third edition, in hard copy and electronic formats. The National Guide is available on the RACGP website or by contacting RACGP Aboriginal and Torres Strait Islander Health on 1800 000 251 or aboriginalhealth@racgp.org.au. So if we want to create a different future and close the gaps that still exist between Aboriginal and Torres Strait Islander people and other Australians, we need to stop putting Intergenerational Trauma in the too-hard basket. The National Apology to the Stolen Generations in 2008 was a landmark event. It was a moment of truth telling which is critical when you’re trying to heal from trauma. But it was a starting point not a solution. The latest progress report on Closing the Gap shows that efforts to address appalling levels of disadvantage have made marginal improvements, in spite of billions of dollars in government funding. Closing the Gap is complicated, but it’s not impossible. We just need to invest in strategies that have been proven to work and be prepared to invest beyond political cycles and social fads. 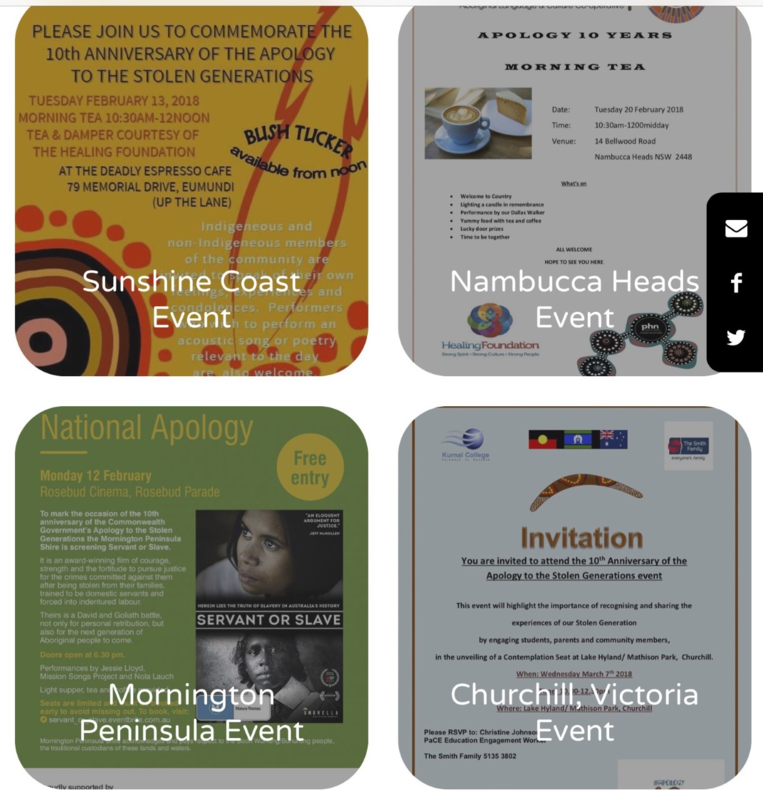 Communities across Australia, from Kununurra to Mildura, Casuarina to Logan, the Mornington Peninsula to Cherbourg and Muswellbrook to Adelaide, will come together this month to commemorate todays 10th anniversary of the National Apology to the Stolen Generations on 13 February 2008. See this list of events. 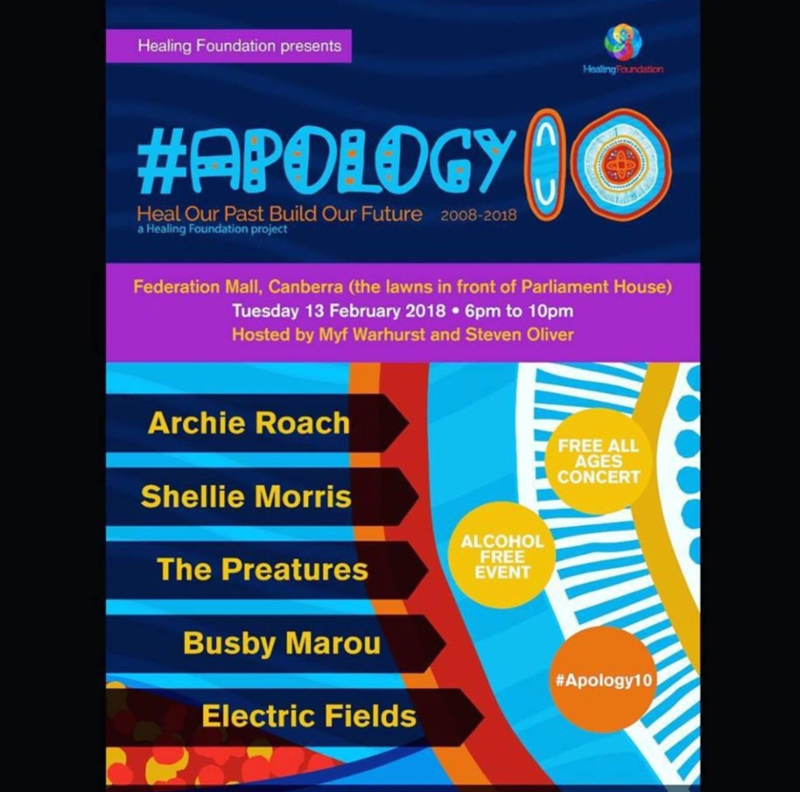 #Apology10 is also hosting a free community concert in Canberra to mark #Apology10, featuring Archie Roach, Shellie Morris, The Preatures, Busby Marou and Electric Fields, hosted by Myf Warhurst and Steven Oliver. 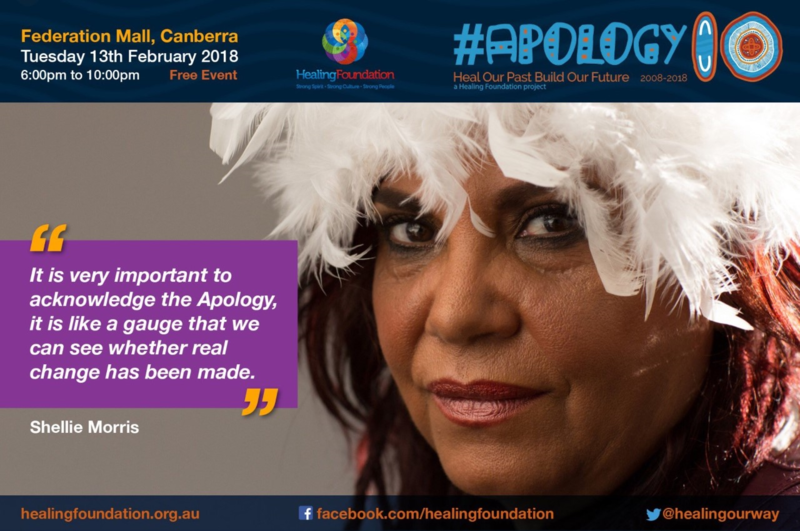 See also this video series marking the National Apology being published by IndigenousX – featuring Uncle Jack Charles, Amnesty Australia’s Roxanne Moore, and Gavan Moor and Chris Dunk. Anniversaries are a good time for reflection and as we commemorate the 10th anniversary of the National Apology today, I hope we can use the momentum to achieve something we’ve never managed to realise before—a serious commitment to tackle unresolved and Intergenerational Trauma in Aboriginal and Torres Strait Islander communities. 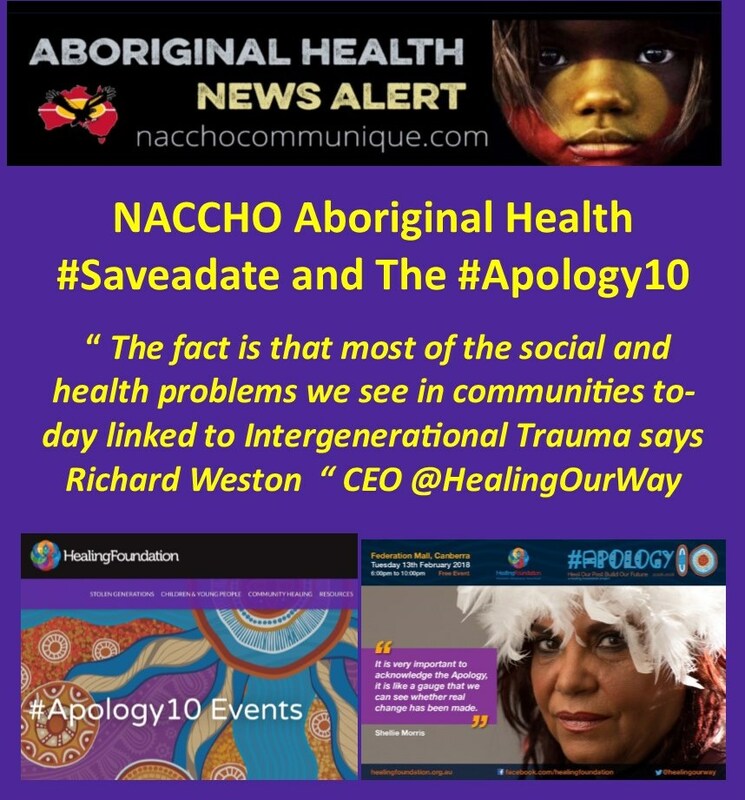 Ten years on from the Apology, and 20 years on from the tabling of the Bringing Them Home report that recommended that apology in the first place, there are still thousands of our people held back by the impact of trauma. Almost every Aboriginal and Torres Strait Islander family is affected in some way. To give you an idea of what I mean, more than 12 per cent of the people who gave evidence of abuse to the recent Royal Commission into Institutional Responses to Sexual Abuse were Aboriginal or Torres Strait Islander. But we’re not just talking about events of the past. A study in Western Australia found that one in five Aboriginal children were living in families now, where between seven to 14 major life stress events had occurred in 12 months. Most Australians prefer to think about the Stolen Generations—and other brutal episodes in 230 years of colonisation—as a phenomenon of the past. But the impacts are very much part of the here and now. 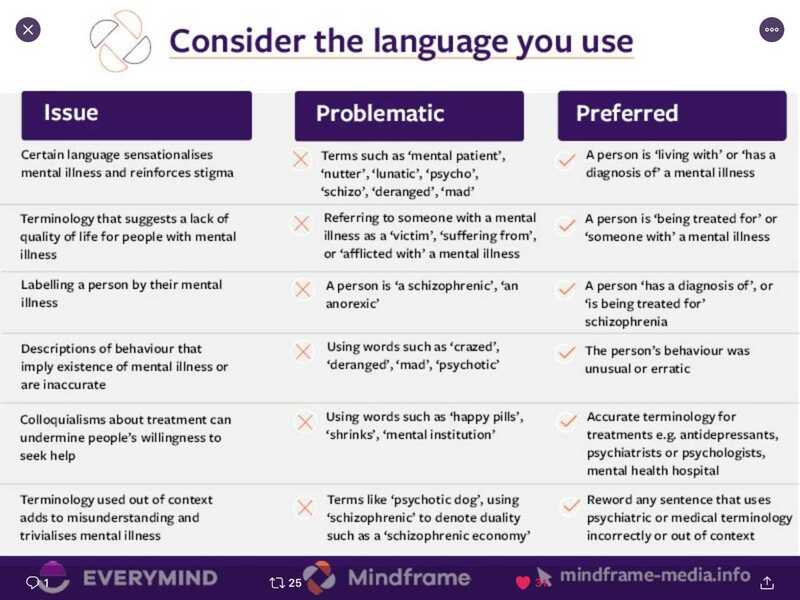 Trauma affects the way people think and act and overwhelms their ability to cope and engage. If people don’t have the opportunity to heal from trauma, it’s likely that their experiences and negative behaviours will start to impact on others, particularly children who are susceptible to significant developmental damage when they experience trauma at a young age. This has created a cycle of trauma, where the impact is passed from one generation to the next, creating a snowball effect of cumulative damage. Research backs this up. The Stolen Generations and their children and grandchildren are twice as likely to be arrested by police and a third less likely to be in good health, compared to other Aboriginal and Torres Strait Islander people who are already at a disadvantage. The Healing Foundation is finalising the first full analysis of current needs for the Stolen Generations, particularly as they enter the aged care sector, and to address issues like national reparations. When we talk to members of the Stolen Generations, they tell us over and over again that re-building families through culture and healing is a key priority. Why? Because a traumatised person can’t benefit from programs around education and training. Healing strategies must be implemented alongside enablers like employment, education and economic empowerment, otherwise we will keep wasting taxpayer dollars focusing on symptoms alone. The Healing Foundation has shown that investment in the right programs will create long term change and reduce the burden on public funds. Over the last eight years we’ve seen reductions in violence, juvenile justice rates and out-of-home care for children where healing programs have been implemented. For example, our men’s healing programs have led to a 50% reduction in contact with Corrective Services and a drop in family violence, while programs for young people have potentially reduced contact with the protection system by 18.5% and the juvenile justice system by nearly 14%. To replicate these successes across Australia, we need to scale-up our healing efforts and focus on families and communities, rather than individuals. Today will be a day of celebration to mark a major step forward in the process of healing and reconciliation. But it’s also a day when we need to take stock of what’s working and what’s not. Over the past few weeks I’ve been reminded by young people in our communities that the future holds a great deal of hope. Despite the wrongs of the past, many of them are optimistic and motivated to create change. This gives me hope that we will have something more positive to report after the next decade—and a different future, built on a foundation of healing. 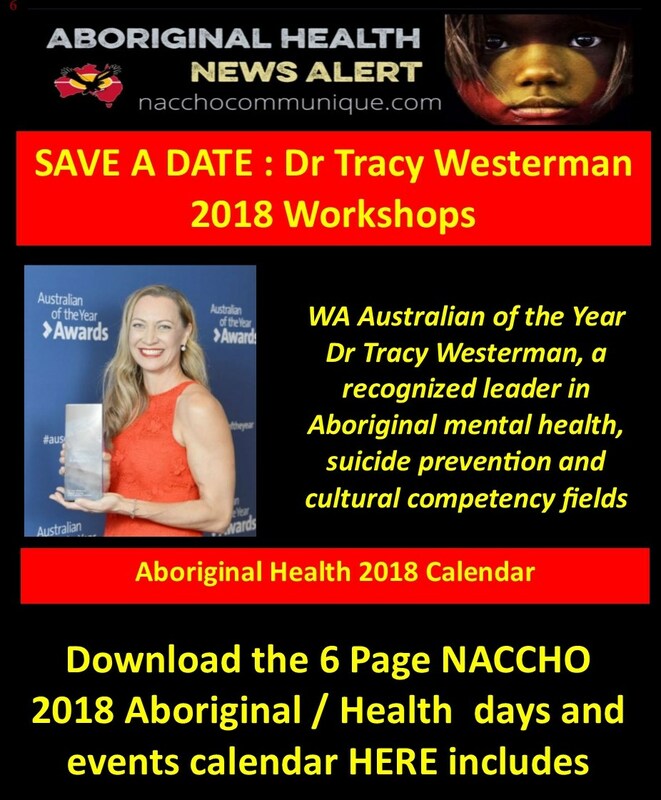 ” Tracy has now trained more than 22,000 Aboriginal and non-Aboriginal service providers, accrediting them in her unique tools and approaches — enabling them to identify early stages of risk in Aboriginal people. Register early as limited workshops are available! Events have been selected on their basis of relevance to the broad Aboriginal health promotion and public health community in Australia. As a psychologist, she now knows that reaction was about the desire to fit in at all costs. Besides, she says, the stakes are too high to make her work a black or white issue. 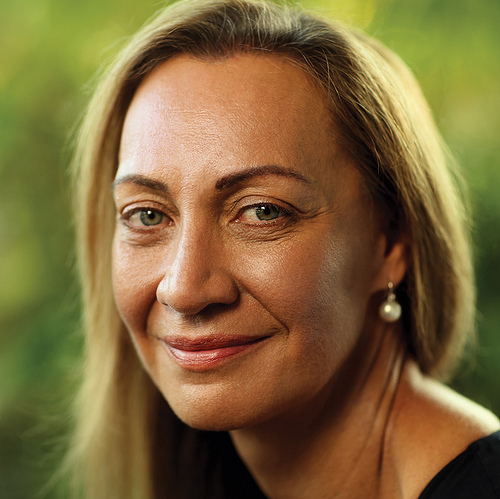 Tracey used the Australian of the Year platform on Thursday to do as she has long been doing — working to improve Aboriginal mental health and help prevent alarming rates of suicide. As she celebrates the 20th year of Indigenous Psychological Services, a business she started because she could see her people weren’t getting the kind of help they needed — and which she is proud to say has never had any government funding — even she finds it hard to believe she almost walked away from psychology. Then the 22-year-old was offered a job working in Kalgoorlie and the Western Desert communities with child welfare. “My first job in Warburton was just after 60 Minutes had been in there to do the big expose on petrol and glue sniffing,” she recalls. “I’d never been in an environment before where there was solvent abuse and there are 5000 household substances you can use to get a high. But she loved the communities and immediately felt she could make a difference. Initially she was like a bull at a gate, wanting to smash all the obstacles at once, but was guided by some wiser heads. “One of my elders said to me ‘It’s like a drop in a bucket. One day you help someone and it’s a little drop in the bucket, and the next day you help someone else and it’s another drop in the bucket and eventually the bucket gets full’,” she says. The experience also made her all the more determined to prove that mainstream psychology methods simply weren’t effective in dealing with indigenous mental health and suicide prevention. In 1998, as she was nearing the end of her groundbreaking PhD, she struck out on her own. “I was 27, I quit government, I bought a fax machine for $300 and just started sending out faxes to people about my training workshops — $600 for four days, fully catered. And that’s how I started my business, in the front lounge of this house. This seemingly innocuous document is shocking on so many levels. Tracy has now trained more than 22,000 Aboriginal and non-Aboriginal service providers, accrediting them in her unique tools and approaches — enabling them to identify early stages of risk in Aboriginal people. 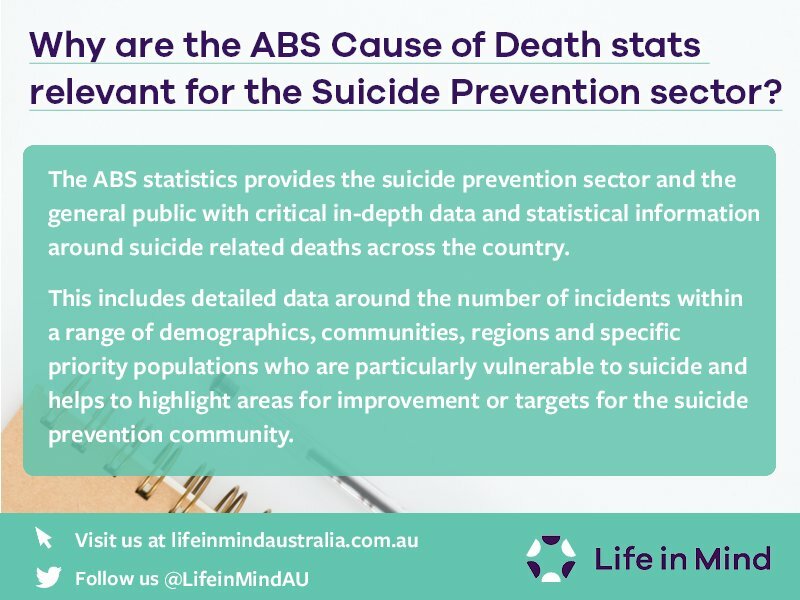 She has also provided her suicide intervention programs to indigenous communities throughout Australia, as well as programs that improve the cultural competence of those working with Aboriginal people. “You have to get people to identify unconscious bias and that’s really challenging. It’s quite common that they come up to me in tears,” she says. She conducts an activity whereby she asks the participants to picture a group of Aboriginal people in a park. “And I go ‘OK, open your eyes’. And on the powerpoint there’s a couple of very well dressed Aboriginal tradesmen at work in the park. 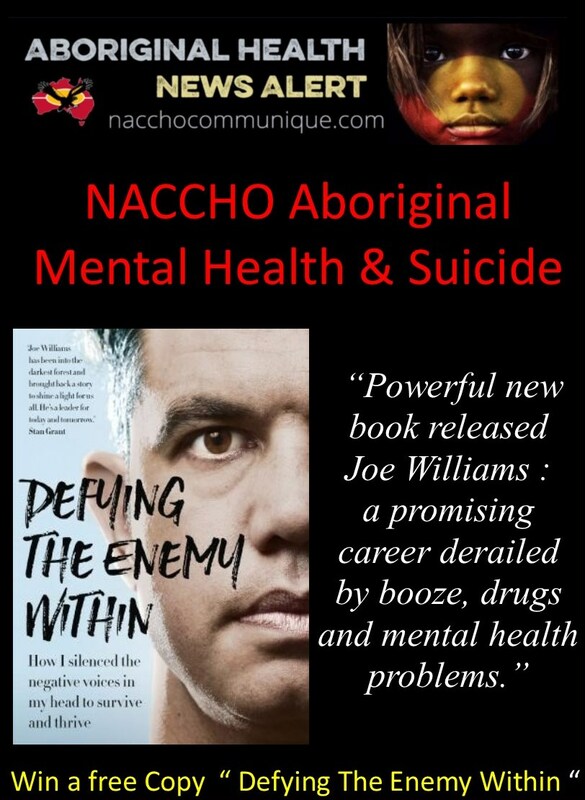 NACCHO Aboriginal #MentalHealth #Suicide : #DefyingTheEnemyWithin Powerful new book extract from @joewilliams_tew out 22 January – a promising career derailed by booze, drugs and mental health problems. “That afternoon, a guy I’d never seen before, who was partying with the group, approached me and asked if I needed anything to help me stay awake. That was the day I had my very first ecstasy tablet. Boom. I was instantaneously hooked. Now I had a drinking and drug problem. But I didn’t for one second think I might have a mental-health problem. I thought that someone who was mentally unwell was “weird” or not stable in society. I even believed that mentally ill people were criminals. Former NRL player, world boxing title holder and proud Wiradjuri First Nations man Joe Williams was always plagued by negative dialogue in his head, and the pressures of elite sport took their toll. Joe eventually turned to drugs and alcohol to silence the dialogue, before attempting to take his own life in 2012. In the aftermath, determined to rebuild , Joe took up professional boxing and got clean. Defying the Enemy Within is both Joe’s story and the steps he took to get well. Williams tells of his struggles with mental illness, later diagnosed as Bipolar Disorder, and the constant dialogue in his head telling him he worthless and should die. In addition to sharing his experiences, Joe shares his wellness plan – the ordinary steps that helped him achieve the extraordinary. 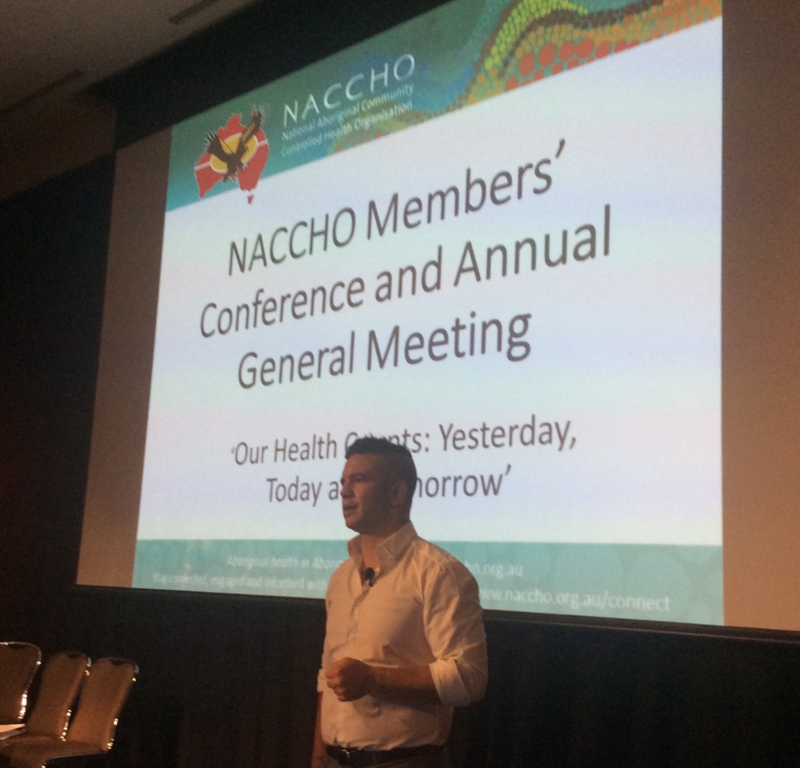 Joe Williams was guest speaker at NACCHO Conference Canberra : See full text from the Enemy Within . MOVING to Sydney to chase my dream in the NRL was a fantastic opportunity; spending my first two years in the big city under Arthur Beetson’s roof gave me a lifetime of memories and an experience I am truly grateful for. But those years also provided me with some of the biggest and toughest life lessons I’ve learned. During the 2002 pre-season, I got my first taste of mixing with the squad as a full-time player. I was expected to train with the team either on the field or in the weights room two or three times a day, five days a week. It was essential to get to training on time but one day I was running late for a mid-morning session because I’d had to stay at Marcellin (College) a bit later than usual for school photos. I raced to training, knowing I’d get in trouble from coach Ricky Stuart for being late. Sure enough, being the tough coach he was, Ricky started ripping into me. When I told him I was late because I had my school photos, he and all the players burst out laughing. For the next few weeks, it became the running joke as an excuse for being late. I learned so much during that off-season and impressed the coaching staff enough to be chosen in the top squad for the trial period. 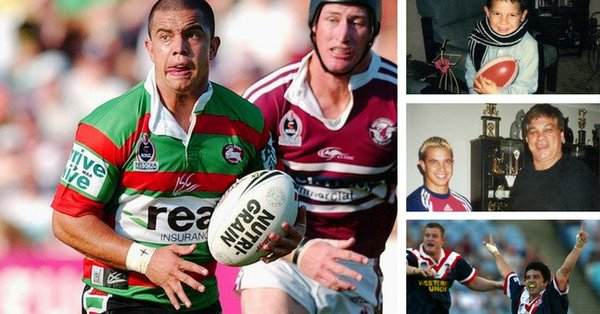 Having just turned 18, it was amazing to play in two trial first grade NRL games at halfback inside Brad “Freddy” Fittler, one of the greatest five-eighths of all. I didn’t make my NRL debut that year because the coaching staff wanted me to gain more experience playing in the Roosters’ under-20s Jersey Flegg side. At the time, though, it was disappointing to go from playing with the first grade team one week to training with guys who were pretty much hoping to get a spot so they’d be contracted. It was after I was put back to the under-20s that I first noticed the negative voices in my mind rearing their ugly head, telling me I didn’t deserve to be in Sydney given I wasn’t playing first grade and that I should just pack up and head back to the bush (Wagga) because I was worthless. Back then, there wasn’t as much emphasis on the psychology of professional athletes and the pressures that came with playing elite sport. There were days when training staff were almost like army drill sergeants. Sometimes they screamed at players and humiliated and even degraded players in front of other members of the team. Occasionally, they would even bring the racial identity of a player into the abuse. It may be that they believed this was the way to make the players mentally stronger and that, if you weren’t mentally strong, you should just give up playing rugby league. For me and many others, that approach of ridicule, embarrassment and tough love didn’t work. In fact, it had the opposite impact of sending my self-esteem lower and lower. But the negative thoughts were a different story altogether. They’d often spiral out of control, to the point where I felt like I was witnessing an argument taking place between two separate people; the negative Joe and positive Joe. The head noise and voices affected my mental well-being so severely that it started to affect me physically. Things grew worse, as the voices wreaked havoc on my ability to think. I started second-guessing every decision I made both on and off the field. The voices became so vivid and loud in my head, it was like I was hearing actual voices. After a while, I became so anxious and down that I’d get to the point where I’d convinced myself I was worthless, a failure. Even on the days I didn’t put a foot wrong on the footy field or won player of the match, I’d convince myself I would be dropped from the squad because of the negatives in my game. I would be scared to go to training because I dreaded the coach saying I wouldn’t be in the team the following week. The only way I knew how to combat these constant thoughts, turn down the voices and deaden the pain I felt, was to drink as much alcohol as I could. Despite the negative voices and drinking, I managed to stay on track with my footy, even captaining the under-20s Roosters team. They were a great bunch of guys and good players and we ended up having a fantastic season and making it through to the Grand Final. On the day of the Grand Final I kicked three goals, had two try assists and kicked the winning field goal. After our first grade team also won their grand final, we had one hell of a party that went on for a few days. During the 2003 season, I was really battling emotionally, suffering from homesickness and looking for comfort at the bottom of a bottle. Instead of concentrating on playing well, I was busy worrying about what drinking and late-night partying the crew had planned after the game. It all began to take its toll physically and mentally. At the same time, I found I was clashing with some of the coaching staff. I became desperate for a change. As a result, I decided to move to South Sydney Rabbitohs. When I called my mother to tell her I’d signed with the Rabbitohs, she burst into tears of joy. Mum had been an avid Souths fan since she was a young girl and had dreamed that one day she’d get to see me run out in the famous red-and-green South Sydney colours. I’d signed with Souths to show I was still keen to be an NRL player but the money wasn’t great so the pre-season was tough. As a result, I had to make a living like many league players did, working long hours labouring on a construction site. Afterwards, I’d go to football training then get some sleep and do it all over again. To make matters worse, I broke my thumb in the opening trial game and had to have surgery on it, causing me to miss the first six weeks of the season. I was no longer drinking so much or partying hard as I didn’t have much money. After a few weeks of putting a huge effort into training and committing myself both physically and mentally, I was picked in the reserve grade team. I began to play myself into form, stringing a few good games together and it was noticed by the coaching staff. It wasn’t long before I was picked in the first grade team to make my NRL debut. Finally, the time had come to live out my childhood dream. I didn’t sleep a wink the night before my first grade debut. On the way to Shark Park, I seemed to take every wrong turn and was late for the warm-up. To my surprise and happiness, though, the coach had organised for my dad to present me with my playing jersey. I’d dreamed of this moment for most of my life and the fact I was playing for the mighty South Sydney Rabbitohs made things even sweeter. People sometimes ask me what it was like playing my first NRL game. The funny thing is, I copped a knock to the head that gave me a mild concussion for the rest of the match. I do remember that we lost but one thing that stood out for me was that my idol, close friend and mentor Dave Peachey was playing in his 200th NRL game. After the siren and when we were shaking hands, “The Peach” said to me: “Young brother, as my career is nearing its end, yours is just starting. Good luck”. Joe Williams tells his story. I had spent my entire life chasing the dream of becoming an NRL player. I now had the monkey off my back and it was time to get to work and live up to my potential. Unfortunately, wins were few and far between for Souths in 2004. My alcohol abuse was becoming rampant again, now I was earning more, and playing first grade had sent my ego to an all-time high, especially after I was named Rookie of the Year in 2004. Things got even worse when I discovered party drugs during the 2004-2005 off-season. I enjoyed being the life of the party, laughing and joking, the centre of attention. On Mad Monday, I celebrated by drinking so much alcohol I couldn’t stand up. That afternoon, a guy I’d never seen before, who was partying with the group, approached me and asked if I needed anything to help me stay awake. That was the day I had my very first ecstasy tablet. Boom. I was instantaneously hooked. How wrong I turned out to be. 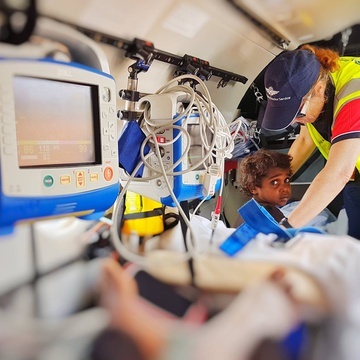 “The nine Aboriginal Medical Services in the North Coast region of NSW , such as Bulgarr Ngaru, Jullums and Bullinah are doing some outstanding work to support their patients. This includes ensuring that community members with chronic disease get to see the health practitioners they need to, are provided with specialised medical aids where necessary and are assisted with transport to attend medical appointments. The Federal Minister for Indigenous Health, Mr Ken Wyatt AM, has announced that the Commonwealth has invested more than $9.1 m in a range of health services specifically for Aboriginal communities across the North Coast. North Coast NSW – comprising Northern NSW and the Mid North Coast – has an average Aboriginal population of 4.5%, nearly double that of other areas of Australia (2.5%). 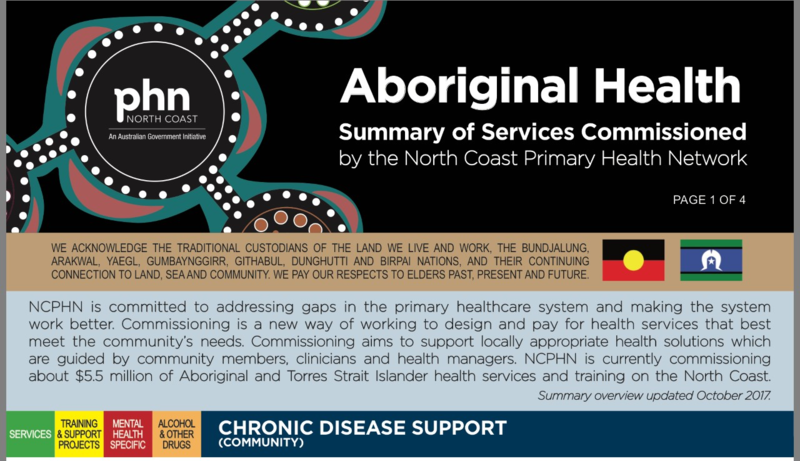 Funding distributed through North Coast Primary Health Network (NCPHN) enables 14 different service providers to deliver a range of services and programs from Tweed Heads down to the Clarence Valley. These services help fill identified health service gaps and provide specialised training for both health professionals and community members. 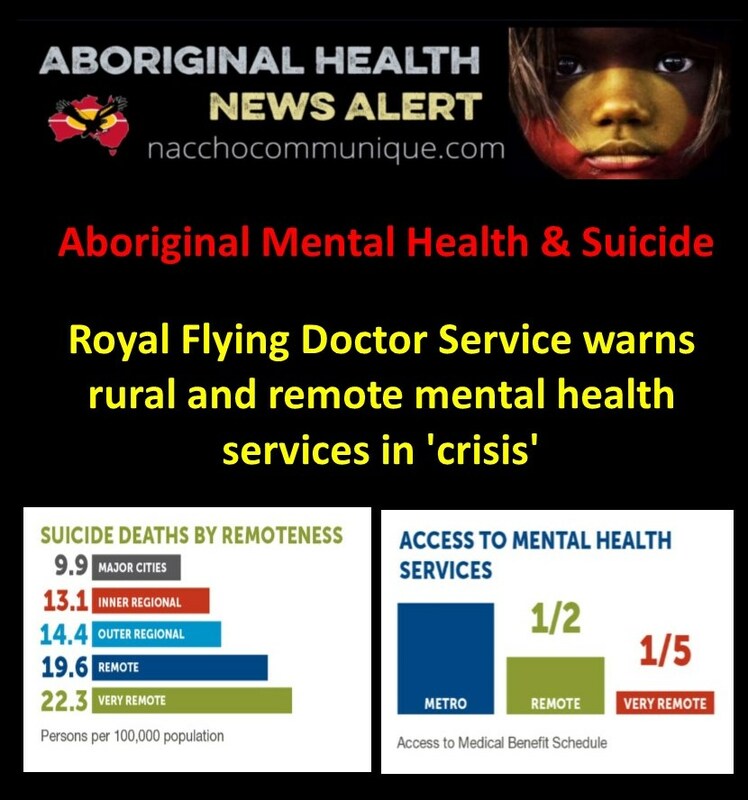 In the Needs Assessment conducted by NCPHN last year, health service providers said that mental health and drug and alcohol counselling were the two health services that Aboriginal and Torres Strait Islander people found most difficult to access. 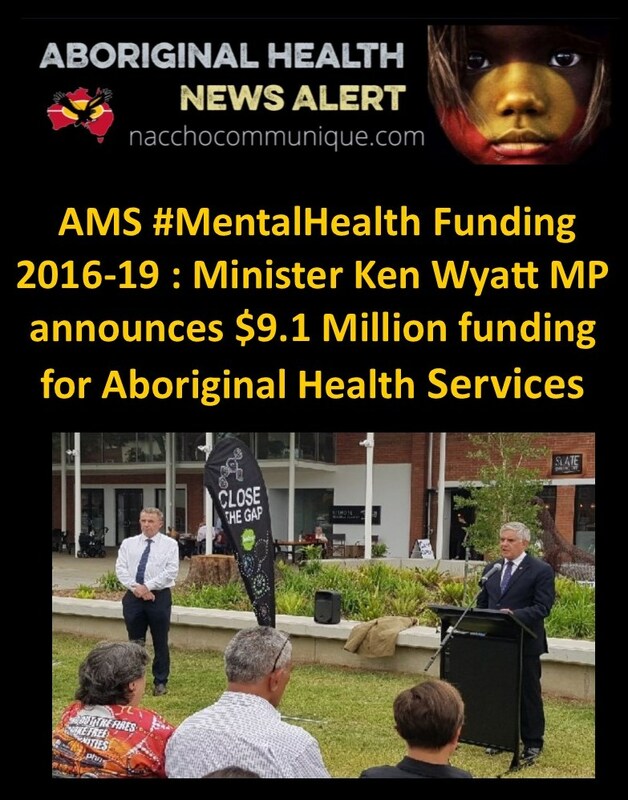 Mr Wyatt said he was delighted that a significant amount of the funding had been distributed to deliver such services and programs to meet the needs of the Aboriginal population. He also praised the work being done by Aboriginal Medical Services. North Coast Primary Health Network Chief Executive Dr Vahid Saberi said it is pleasing that NCPHN had been successful in commissioning such a range of health services specifically for Aboriginal people. The funding is also providing much needed training in suicide prevention for both community members and health professionals, as well as specialist support for clinicians working with people with drug and/or alcohol issues. Integrated Team Care: $5.029 million (2016-18) to improve access to coordinated care for chronic conditions and culturally appropriate care. 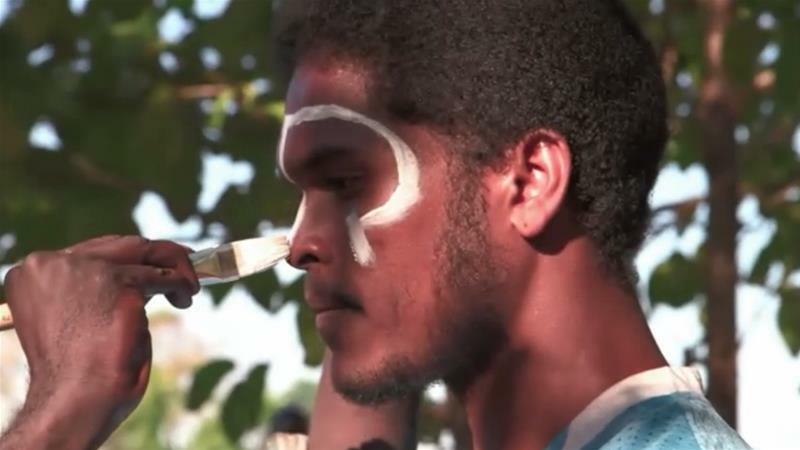 Drug and Alcohol Treatment Services for Aboriginal and Torres Strait Islanders: $2.095 million (2016-19) to increase capacity of the drug and alcohol treatment sector though improved regional coordination and by commissioning additional drug and alcohol treatment services for Aboriginal and Torres Strait Islander people. 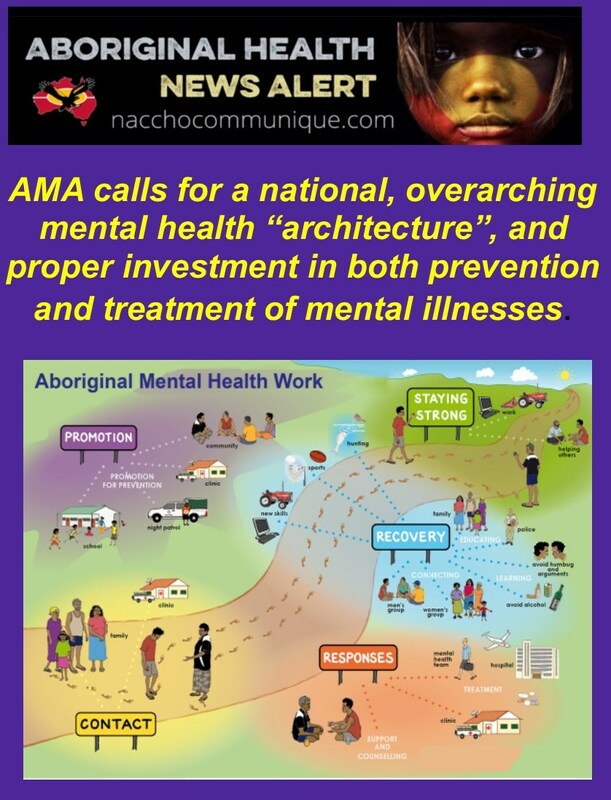 Indigenous Mental Health Flexible Funding: $2.006 million (2016-18) to improve access to integrated, culturally appropriate and safe mental health services that holistically meet the needs of Aboriginal and Torres Strait Islander people. Click here to download a summary of current NCPHN commissioned services. Providers: Jullums Aboriginal Medical Service (AMS) Lismore, Bullinah AMS, Ballina, Bulgarr Ngaru Aboriginal Medical Corporation; Durri Aboriginal Medical Corporation; Werin Aboriginal Corporation Medical Clinic; Bawrunga Coffs Harbour GP Super Clinic Ltd. This program is run through Aboriginal Medical Services and supports Aboriginal patients with chronic disease in purchasing specialised medical aids and with transport and support to attend GP and specialist medical appointments. Delivered across the entire region. The project aim is to align the Alcohol and Other Drug (AOD) service delivered by Jullums to national guidelines for managing people with co-occurring alcohol and drug issues and mental health conditions in community settings. The guidelines will be amended to ensure that the service is culturally appropriate and is tailored to meet the needs of each patient. Addiction specialist support to the clinicians working in Bulgarr Ngaru medical clinics, located in Grafton, Casino and Tweed Heads. Clinician support for management and treatment of drug/alcohol issues – Grafton and surrounds. The Kidney Health Project aims to improve early identification and interventions to achieve better kidney health, thus preventing the onset of chronic kidney disease. Run in collaboration with Northern NSW Local Health District. To be run across Northern NSW. Clinician support for management and treatment of drug/alcohol issues. Delivered in Lismore and surrounds. A holistic and culturally appropriate cardiac health prevention and management program. Delivered in the Port Macquarie LGA. Assisting families with a range of health related matters, identifying ways to improve health outcomes. Delivered in the Nambucca region. Working with Mid North Coast LHD staff to improve mental health and wellbeing. Mid North Coast region. Maayu Mali means to “make better”. It offers a 3-month residential rehabilitation program followed by after-care services, delivered in a culturally sensitive context to people experiencing drug and alcohol addiction. Hastings-Macleay region. This is a program for Aboriginal men with both alcohol and/or other drug issues and mental health problems. It works to re-connect Indigenous men to their history, culture and community. Delivered for residents in Ballina, Lismore, Byron Bay, Casino and Kyogle. Mental Health First Aid courses teach mental health first aid strategies to community members. The first aid is given until appropriate professional help is received or the crisis resolves. Delivered in Alstonville. 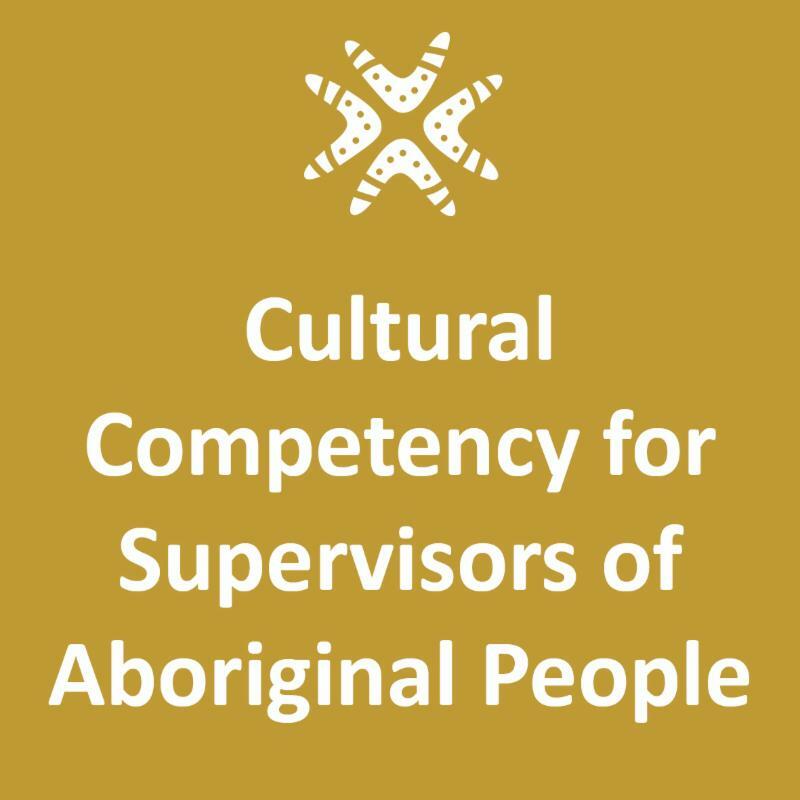 Aboriginal workforce development, capacity building, information and education for health professionals to improve the coordination and integration of drug and alcohol treatment services. Delivered across Northern NSW. Enhances social and emotional wellbeing, particularly with complex health needs in relation to disconnection, trauma and substance misuse. Delivered in Lismore, Alstonville and Ballina. The Life Tree Mental Health & Suicide Prevention Training Program for Aboriginal community members. Delivered across North Coast. 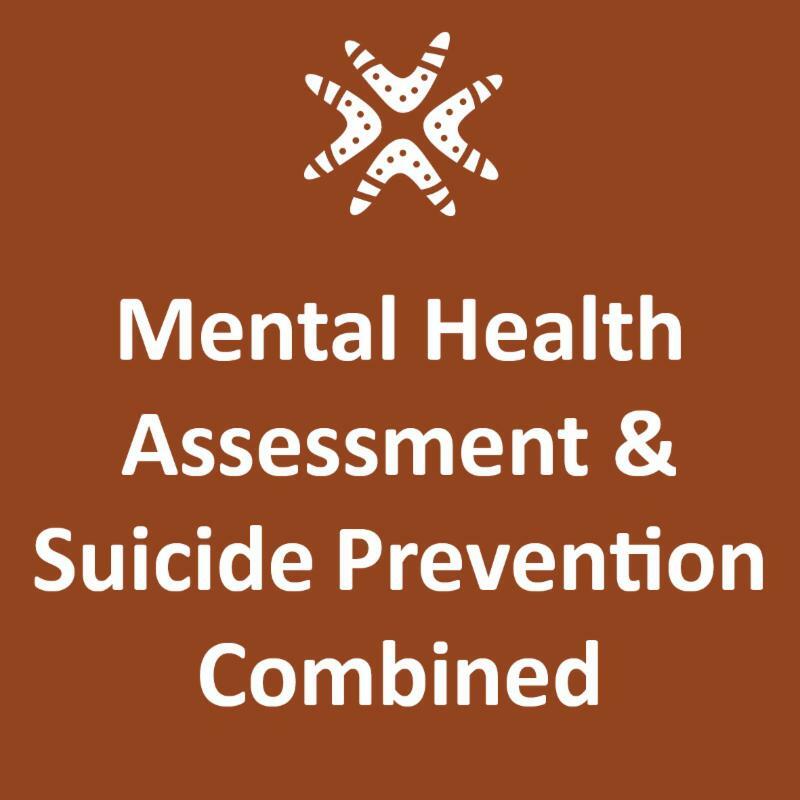 The Life Tree Mental Health & Suicide Prevention Training Program for clinicians working in Aboriginal Health. Delivered across North Coast. A creative arts project to nurture local Indigenous artists and to prepare work for a special exhibition at the new Lismore Regional Gallery late in the year. It’s well known that engagement in the arts can enhance health and wellbeing. Delivered in the Northern Rivers region. 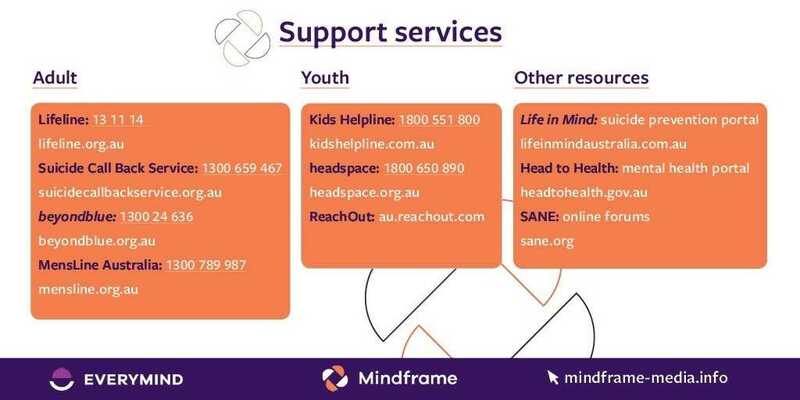 A free, referral-based psychological service for those needing access to mental health services who are financially disadvantaged, including members of the Aboriginal community. Delivered across North Coast. 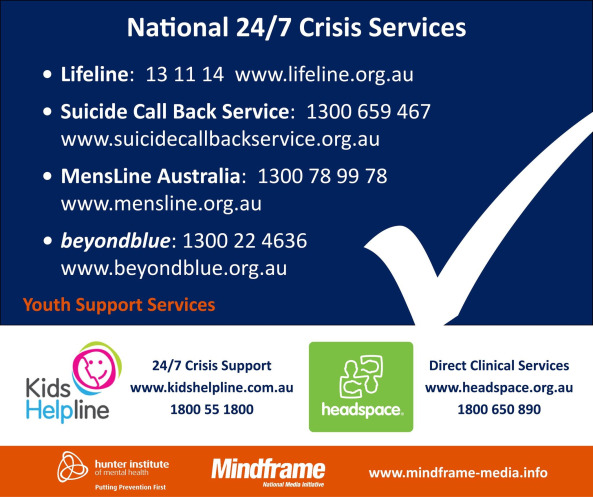 For people with a mental illness impacting severely on their lives, including members of the Aboriginal community. Delivered across North Coast.